Volkswagen Golf TDI Review: Diesels are back, and they’re fun, clean and inexpensive to run. Europeans have appreciated the advantages of Diesel-powered cars for decades, and they buy them in mass quantities. Now, in America, with ultra low sulfur clean Diesel fuel, and the technologies to limit emissions, Diesel powered cars are now sold even in emissions-conscious California. I recently spent a week in VW’s sixth-generation Golf TDI diesel and have plenty to say about it. What’s missing? The “following-the-old-bus” exhaust smell, sluggish performance, clattering engine noise, and unpleasant fill-ups, all gone. Driving one of these new Diesels is painless and shockingly economical. Just check out the numbers. My Candy White test car featured the new 140-horsepower 2.0-liter four-cylinder Diesel. 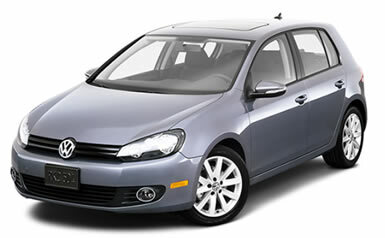 The inline, five-cylinder gas engine in regular Golfs boasts 170 horsepower, but just 177 lb.-ft. of torque. My Golf TDI churns out a huge 236 lb.-ft. of torque at low rpm, so not only do you get more than decent acceleration from a stop, but a little tap on the accelerator (don’t call it “the gas”) on the freeway and you’re shooting ahead in no time. Here are some more numbers. My tester’s EPA fuel mileage is 30 City, 42 Highway. I averaged 37.5 mpg in a week’s travel, a significant part of it on the highway. That’s only about five mpg lower than the last Toyota Prius hybrid I tested! Diesel fuel is now priced between regular and mid-grade gas, and with the low sulfur Diesel, it has virtually no odor when you go to the little green pump to refuel. The EPA’s Green Vehicle Guide awards the Golf a 7 for Air Pollution and an 8 for Greenhouse Gas, good for Smartway status. In a Diesel? Yes, indeed. So, what’s new with this brand new car? Well, the body styling is a revised take on the now classic two-box hatchback theme, in two or four doors. If anything, the contours are a little more edgy, with the headlamps and taillamps more rectangular, and the two-bar grille more horizontal. You’ll still be able to recognize it as a Golf. And by the way, the retro experiment of calling the car a Rabbit, complete with the rabbit graphic, is over with the 2010 model. As a hatchback, the Golf drops its rear seat and swallows your cargo, like an SUV. I slid my upright bass in nicely, but any number of configurations would happily rest there as well, like your new flat-screen TV for example, or a dorm room’s worth of junk. Despite its 165-inch length, this is one of the best combinations of fun, economy and usefulness you’re going to find for sale on wheels today. The TDI, which stands for Turbo Direct Injection by the way, offers more than just a strong, environmentally sensitive powerplant. And the electro-mechanical, variably-assisted, power rack-and-pinion system, with a quick ratio, makes for a real sense of control. For safety, the car’s Electronic Stability Program (ESP) uses its electronic brain to compare your driving intentions with the vehicle’s actual direction and steps in to alter the latter if it doesn’t match your input, all automatically. Lock (EDL), Hydraulic Brake Assist (HBA) and Electronic Brake-pressure Distribution (EBD). These happy acronyms are all watching out for you as you drive. Four-wheel disc brakes with ABS are standard. Most of the time you spend with your car is not admiring it in your driveway, it’s inside. VWs in general, and this new Golf in particular, are well turned out for long term comfort, starting with supportive cloth seats. The dash, doors and trim are typical nicer-than-you-would-expect VW, and in this new car the shapes flow more than the earlier, more linear design concepts. Assembly, at VW’s historic Wolfsburg location in Germany, is superb. Leather on the steering wheel and shifter upgrades the skin / vehicle contact zones. The TDI comes standard with a touch-screen eight-speaker sound system with AM/FM, Sirius Satellite Radio, and a six-disc CD changer. It also has an AUX jack, and even better, an MDI (Mobile Data Interface) port for your iPod. I heard a little stumble at the start of each shuffled song, but performance was fine otherwise. Pricing for the TDI begins at $22,740 for the two-door with six-speed manual, including destination charge. My tester, a four-door with DSG paddle-shift six-speed automatic, came to $26,614 with the optional Touchscreen Navigation System, Cold Weather package with includes heated seats and washer nozzles, and Bluetooth connection. The gasoline-powered 2-door manual-shift, Golfs begin with an MSRP price of $18,240. The Bottom Line: The 2010 Volkswagen Golf TDI: Unless you plan to tow a boat, or your family has six or more members, you can’t do much better than this car. Plus you get three years of free maintenance and roadside assistance. It’s fun to drive, efficient, clean, practical and reasonably priced. It’s kind of like a no-brainer buy, really.